Is Alkaline Water Good for Weight Loss? Is Alkaline water good for weight loss? Today, I will break down the answer to this question. Then you can decide if alkaline water will help you lose weight. Good morning, I’m your host, Hercules. I’m the guy who writes all the wonderful (I hope so) content on this site for you to help guide in the right direction. There is a TON of misinformation out there about alkaline ionized water and alkaline water benefits. Then there are the people working hard to make you believe that alkaline water is a hoax. Let me make this crystal clear, alkaline water is NOT a hoax! It helped me more than any supplement or medication on the market to recover from chronic fatigue that had plagued me for over a decade. While I do think it’s impossible to completely heal 100% from chronic fatigue, I do know that I haven’t had this much energy since I was a kid. And I was a firecracker of a kid. How can alkaline water help you lose weight? How do better hydration and antioxidants help you lose weight? Are you tired of experimenting with ridiculous diets that tell you to eat one thing, but not another? Perhaps you’ve been sold false hope by scam artists who promised to deliver a miracle cure. First, there is no miracle cure for weight loss. However, there is a great way to lose weight without having to jump in the gym every day or eat nothing but salad greens without dressing for weeks on end. You don’t want to turn into a rabbit, do you? Good, because I don’t want to either. Alkaline ionized water hydrates out bodies faster and more efficiently. It is also packed with antioxidants that fight free radicals that can cause premature aging. Let’s start with the energy boost you get from drinking alkaline ionized water. When you have more energy, you will naturally burn more calories throughout the day. Imagine a day without that afternoon crash that takes several cups of coffee to get past. Trust me, I’ve been there, and it’s a vicious cycle to be in. When you drink alkaline ionized water, you lift that dark cloud of energy that finds you even when you’re trying to hide. Get away dark cloud! We don’t want any! I drink alkaline ionized water every morning after I brush my teeth. It’s the first thing that goes into my body, and it gives me an instant jolt of energy. I feel as though my body was just given exactly what it needs to function, and I’m right. Always remember, most of our body is made of water. In Japan and Taiwan, alkaline ionized water is already a socially accepted source of great health. When I lived in Taiwan, I discovered ionized alkaline water in every convenience store, including the 7-Eleven. Don’t be surprised if, within a few years, you start seeing alkaline water throughout America. 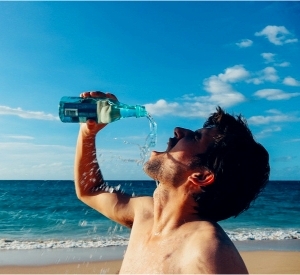 Let’s take a look at some promising research on alkaline water in Asia. Japan found that drinking water on an empty stomach in the morning jump starts your metabolism. You should never feel thirsty. If you feel thirsty, your body is already dehydrated. Dehydration can lead to a long list of health problems. Since alkaline ionized water is better at hydrating our body, it’s better at helping us avoid dehydration. Drinking water instead of high-calorie drinks is a quick way to decrease calories. Most people who own alkaline water machines report that they quit soda and drink a lot more water because of the great taste of the water. Are you starting to see how drinking water alone can lead to less fatty calories, fewer unhealthy cravings, and less dehydration? Another study found that drinking water on an empty stomach can increase metabolism by as much as 30%! This could be TMI for some, but I’m going to run with it anyway. Before I began drinking alkaline water, constipation crept into my life. I never had any problems with constipation. Needless to say, the problem was distressing. Once I began drinking alkaline ionized water, my digestion went back to normal. Every morning, after my couple or few cups of alkaline water, I’m heading to the bathroom with a smile on my face. Drinking a couple cups of alkaline water on an empty stomach before bed also helps. While we sleep, our bodies keep on working to flush out toxins and do repairs. The antioxidants in alkaline water make your body’s job a lot easier while you sleep. If you are a fan of intermittent fasting like me, alkaline ionized water is the best water to drink during your fast. While I battled constipation, my lower belly was bloated. Now, its much flatter than before, and I still eat as much as I want. A study in China tested 5,783 people and found that water intake most consistently affected a person’s overweight status. Again, this goes back to the point I mentioned earlier that water gives you more energy, and alkaline ionized water is a great source of productive energy. The main reason for drinking alkaline water is to balance the body’s pH and reverse harmful acidity in the body that has plagued us our entire lives. Most bottled water is slightly acidic and lacks antioxidants. Tap water is typically neutral, but it can be slightly acidic depending where you live. The more important factor is the chlorine content. It makes sense that flooding the body with antioxidants to slow down, or even halt, premature aging would help us lose weight in return. When the body is balanced, it can do its job a lot better. There’s no need to get on some fad diet or buy into a lofty miracle. Any bodybuilder will tell you that a caloric deficit leads to weight loss. This means you are burning more calories than you are taking in. Drinking more water makes this task easier to accomplish. It’s important to do it the right way. If you’ve ever seen bodybuilders flexing in a competition, they look amazing because they are starving. They bulk first, then cut way back on their calories to get that amazing cut look. I’ve seen several alkaline water machine owners report less soreness after working out. Less muscle soreness after working out equals less time between gym sessions and better muscle recovery after a hard workout. The reason alkaline water does a great job of neutralizing muscle soreness is that it helps neutralize the lactic acid in our bodies that gets released during a hard workout. Aside from quicker recovery after gym sessions, I’ve seen people who were able to reduce arthritis pain and joint pain by drinking alkaline ionized water. They reported being able to walk longer distances. The more you move around and exercise, the more calories you burn. While doing my research, I came across numerous reviews written by people who said that they had lost weight by drinking alkaline water alone. In my review here, I found one verified reviewer who credited Cosan Life Water for going down from 250lbs to 193. The Cosan/USA Pure Hydration ionizer makes alkaline ionized water with molecular hydrogen. She also reported that she has “way more energy” since starting to drink alkaline water daily. These reports are certainly promising. I can tell you from my own experience since I began drinking alkaline ionized water that I have lost some weight, and my digestion is much better. If you want to burn stubborn belly fat, you should have a good idea of how alkaline water can help you after reading my article. However, it’s important to remember that there is no miracle cure. Yes, drinking alkaline water alone can help you lose weight, but it depends how you do it. 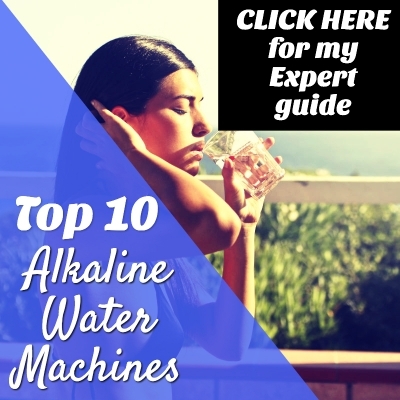 If you follow my article and drink alkaline ionized water on an empty stomach when you wake up and before bed, you will have a much better chance of achieving the weight loss benefits of alkaline water. Once you have more energy, you will naturally lose more weight by moving around and burning more calories. If you lost weight and experienced an energy boost by drinking alkaline water, let me hear your story in the comments section below. I’d love to hear about your weight loss journey! Thanks for sharing your insights. Very valuable.